Lincoln has been out for over three months and has grossed over $220 million, meaning that I may be a little late on writing a movie review. But as yesterday was Lincoln’s birthday, the Oscars are in a couple of weeks, and I just finally got around to seeing the movie, I think I have a strong case that this post is timely. Most importantly, no one bothered to tell me that Lincoln was a movie about grief, and that undoubtedly warrants a post. Now, when I say the movie was about grief I mean that, if you don’t count slavery, the Civil War, feuding political factions, and the Thirteenth Amendment, the primary theme of the movie was grief. There is a lot we can learn from the film’s portrayal of grief, and yet no one seems to be spending much time talking about it. There may be a mention of the loss of the Lincoln’s son Willie here, a reference to Mary Todd Lincoln’s well-documented grief there, but that’s about it. I get it, Daniel Day-Lewis was amazing and passing the Thirteenth Amendment was monumental, but since what we do here is talk about grief, let’s look at some of the things the movie does well in tackling grief and loss. I know, I know, old news, right? But what this movie captures incredibly well is what that means when two people in a relationship are grieving and the discord it can cause. Having lost their son Willie two years earlier, we see the stark contrast between Lincoln’s quiet, internal grief and Mary Todd Lincoln’s effusive grief. As a viewer we clearly see how deeply they each grieve the loss of their son and we feel their unique pain. Yet there is a scene in which Mary accuses Lincoln of not grieving Willie’s death, and it seems reasonable. His grief manifests so differently than her own that we understand her confusion and frustration. Though Lincoln seems impossibly frustrated with Mrs. Lincoln’s inability to understand his grief, he does the only thing he can do when grieving in a relationship: try to explain how he feels and why he manages the grief the way he does. His grief does not look like hers, and as a president he cannot afford to grieve in the same way she grieves. But what is clear to us as viewers is that his grief is equally valid. There is no timeline for grief. I know, also old news. But what we see in the film is the willingness of Mary and Abe to talk about their loss years later. In a society where we so often pressure people to “get over it”, we see the impact of their deep grief years after the losses of their sons. As grievers we know that grief doesn’t magically go away, but we rarely see it so clearly demonstrated on-screen. We often see movies about illnesses or deaths and the grief that immediately follows, but this film gives us a glimpse into the very real experience of continuing to live with that loss over time. We see Mary continuing to struggle with her pain and guilt and the two struggling to understand one another’s grief years after the loss. We see them working through it and we see it isn’t easy. No myths about “getting over it” in a year or “moving on” here. Talk to your kids about death and grief. The relationship we see between Lincoln and his youngest son, Tad, is nothing short of heartwarming. There is an honesty in their relationship that Daniel Day-Lewis captures in some of the most subtle and genuine scenes in the film. In a society filled with discomfort and anxiety around talking to kids about death, we see Lincoln and Tad comfortably talk to one another about Willie, acknowledging how much they each miss him. This is not a long, dramatic, or exaggerated scene. Quite the opposite, in fact. The brief and natural exchange between them make us feel as though Lincoln has created an environment in which Tad feels open and comfortable talking about his brother. It is not a grand, singular conversation, but a part of their everyday life after loss. Grief connects us to other grievers. 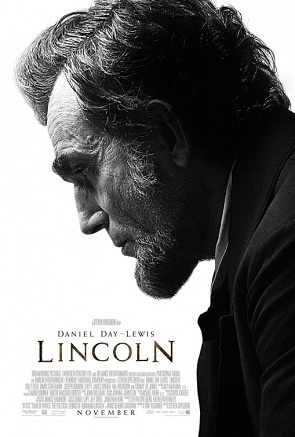 This movie does not introduce us to Lincoln before the loss of his sons, but throughout the film we get the sense that Lincoln feels a deep connection to the death he is surrounded by in the war due to his own losses. Lincoln’s political scheming in the movie and his delays to the end of the war show Lincoln in a light that my high school US History teacher failed to mention. As tempting as it is to fault Lincoln for the lives lost due to his (perhaps necessary) delays to ending the war, Day-Lewis shows us a Lincoln who appears to feel the deep impact of every individual loss of the war. As he tries to prevent his oldest son from joining the war, he seems to recognize every soldier as someone’s son. 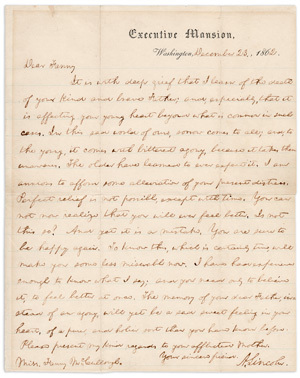 Lincoln is well-known for the heartfelt and genuine condolence letters he sent to families during and after the war. In the film Day-Lewis shows us a Lincoln who felt genuinely connected to those losses and provides a context for his heartfelt letters. We are always seeking meaning in our loss. Lincoln’s grief doesn’t make him entirely lovable in the film, as he attempts to use his understanding of loss to his political advantage. Lincoln is on a mission in the film, and we see that he pushes beyond ethical boundaries for his cause. Trying to buy, barter, and otherwise manipulate votes, we see Lincoln go to some questionable lengths to pass the Thirteenth Amendment. Though some might argue exchanging federal positions for votes was the most ethically compromising of his behaviors, I would argue it was Lincoln’s manipulation of another man’s grief. Knowing that an opponent to his amendment lost a brother who fought for the Union army, Lincoln suggest to him that the only way his brother’s loss will have meaning is if the amendment passes. He suggests that, should it fail, his brother’s death will have been in vain and puts it on this man to vote for the amendment for this reason. This is not a pretty side of Lincoln, and yet it does reflect Lincoln’s understanding of our deep need to create meaning when we lose someone dear to us. We so desperately want to find answers, reasons, and meaning, which can be very difficult to find. Though we, of course, root for the Thirteenth Amendment throughout the film, the only “no” vote I found myself cheering for was this one. Standing up and recognizing the memory of his brother, this gentleman votes against the amendment. If the amendment hadn’t passed I’m sure I’d feel differently, but as it did you can’t help but feel good that Lincoln did not succeed in winning this vote through the manipulation of another’s grief. In case you are not one who contributed to the $220 million this movie has grossed so far, check out the trailer here. What did you think of Lincoln’s portrayal of grief? Leave a comment to let us know! 0 responses on "5 Things Lincoln Can Teach Us About Grief"